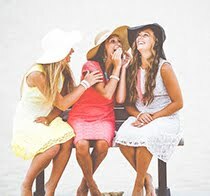 I love Free stuff ... especially if it's my favorites. Well it's not exactly free, it's more like 50% discount for the McDonald's Filet-o-fish. 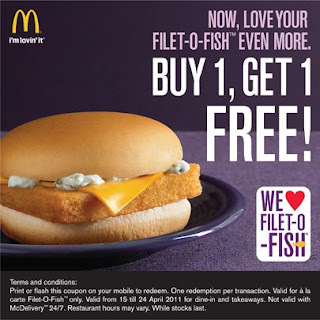 If you are a Filet-o-Fish Lover don't miss this one for one offer from McDonalds. The best part is that you can just save this promotion picture to your phone and flash it at the counter. Thanks McDonalds for helping to save the earth! Buy 1 get 1 free valid from 15-24 April 2011. Terms and conditions: Print or flash this coupon on your mobile to redeem. One Redemption per transaction. Valid for a la carte Filet-O-Fish only. valid from 15 till 24 April for dine-in and takeaways. Not valid with McDelivery 24/7. Restaurant hours may vary. While stocks last. McDonalds, if you read this you should give me buy 1 get 5 free... why?